Nothing shuts down your job search faster than a resume with formatting issues. The checklist below will show you how to format your resume step-by-step so you don’t miss anything. Make sure you’re setting your resume up correctly when starting to write or update it. Most people include name, phone number, and email. You can also include LinkedIn. Make sure all of your information is correct. Are the hyperlinks all active and pointed to the correct place? Are the right letters capitalized? Etc. Commit to a consistent comma strategy. This means you must choose between keeping or omitting that last comma in a list (bananas, apples and oranges) OR (bananas, apples, and oranges). Both ways are considered correct– just make sure you stick to whichever way you prefer. Make sure your text spacing is consistent. 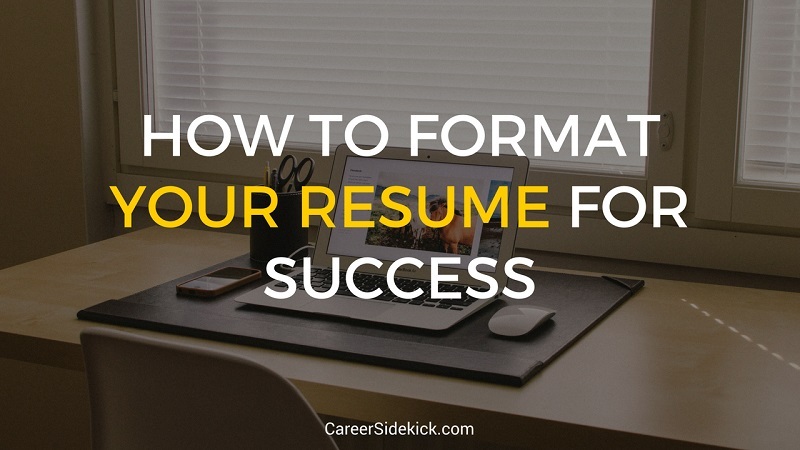 This is an important piece of how to format your resume. Even though it might seem like a small detail it can distract the hiring manager. So decide if you’re going to have 1 or 2 spaces after each period. Also make sure you have the same distance all bullet points and paragraphs. For the number of spaces after each period, I recommend having 1 space, not 2. It’s seen as more modern and is easier to read on a computer. Try to pick one font and make sure you use it throughout the entire document. If you insist, you can use a separate font for the headings. But that’s it. Don’t use more than this. Use a font size between 10-12 and a sans-serif font like calibri or arial. These fonts are designed to look great on a computer, which is how more and most recruiters and hiring managers are going to read your resume when you send it in. For section headings (i.e., “Experience”, “Education”), you can use a slightly larger font size (13-14). Make sure you are being consistent throughout the whole document. Don’t use size 13 in one part of your resume, and then size 14 later. It’s going to get noticed, and not in the way you want. Make sure you stay consistent with how you’re capitalizing words. When it comes to names of departments (IT, Finance, Legal, etc. ), I recommend capitalizing if because it’ll make the words stand out to the reader. Make sure your page’s margins are the same size on the right and left sides. Then make sure the top and bottom are the same too. I recommend using a margin between 1/2 an inch to an inch all the way around. Tip: Aligning any bullet points to the left rather than indenting will help you get more text on the page – and reads well during an online read. Is the format you have chosen to highlight your employment dates, job titles and company names consistent (i.e. underlines, italics, caps, bolding)? It should follow the same pattern in every job you list. Or every piece of education you list, etc. Pick one format/layout and stick to it. Is there a period at the end of each sentence? Take a close look at bulleted lists too and make sure you were consistent (period or no period is fine, just decide and do it that way 100%). I like to *not* use periods after each bullet point because it encourages the reader to keep going. It makes it feel “smoother” to read. But take a look at it both ways and decide which you like best. Does your two-page resume have a page number? It should. If the hiring manager or recruiter prints your resume and the pages get shuffled, you want to be sure they know the right order to read your resume. You also want them to realize if they’re missing a page (so use “page 1/2”, “page 2/2”, etc). As a side note, for most people, a 1 page resume should be sufficient. If you have less than 7-10 years of relevant work experience, keep it to one page. If you’re having trouble knowing what to keep and what to eliminate, here are the 5 must-have sections on your resume. If you lie on your resume, it can (and probably will) come back to haunt you in the interview. Make sure your facts are straight. Something as simple as saying “Expert in Excel” can cost you the job, if they ask why you said you’re an expert and you’re unable to clearly tell them about your expert-level abilities. So don’t put any claims or facts that you can’t back up or talk comfortably about when it comes time to answer questions in your interview. Once you’ve completed steps 1-11, I recommend getting a second set of eyes to review and proofread your resume one last time.